Last week, Florida’s “hometown grocer,” Publix, found itself trending on Twitter — for all the wrong reasons. Publix was under fire after being exposed as the top donor to a Florida gubernatorial candidate, Adam Putnam, who had happily declared himself a “proud NRA sellout.” The revelation caught the attention of the ever-inspiring student leaders of Parkland, Florida, who quickly called for a boycott and organized a “die-in” protest at a local Publix store. Within 24 hours of the protest, Publix reversed its position — demonstrating an astounding respect for, and willingness to heed, critics — halting its political contribution program and apologizing to its customers. The supermarket chain Publix on Friday announced that it would suspend its political contributions to Adam Putnam, a Republican candidate for Florida governor, after being faced with overwhelming pressure to cut ties with him because of his fierce support for the National Rifle Association. There is much to take away from this brief but stunning episode. First, we — once again — take our hats off to the savvy, indomitable students of Marjorie Stoneman Douglas High School. Their preternatural maturity and creativity have placed them squarely in the leadership of the growing movement for common sense gun laws. And by smartly expanding their strategy to target the corporate patrons of the NRA — companies that simply cannot afford to ignore the concerns of the “customers or the communities (they) serve” — the Parkland students have landed a major blow to the purveyors of gun violence, who seem for all the world to value profit over the lives of our children. At the same time, it is, to say the least, surprising to hear Publix declare that it would “never knowingly disappoint our customers or the communities we serve,” when it has turned its back for years on countless customers who have emailed, called, and protested to express their legitimate concerns over human rights violations in Florida’s fields. Parkland students and their supporters are right, in every way, to demand accountability from Florida’s popular grocer in light of the unspeakable gun violence that has riddled the community it serves in recent years. 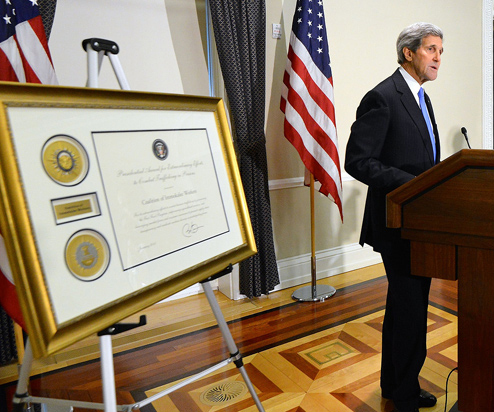 But what of Florida’s farmworkers? Are they, and their consumer allies, not part of Publix’s definition of “community”? 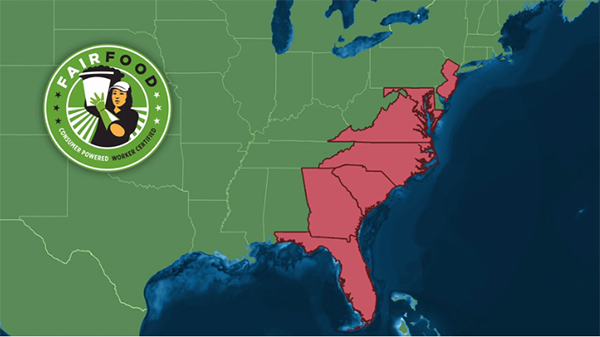 Publix still refuses — after nine years of public protests, cross-state marches, and week-long fasts — to use its considerable market power to fight sexual violence and other human rights abuses in the East Coast agricultural industry. That Publix is “knowingly disappointing” the men and women who harvest its fruits and vegetables — not to mention the hundreds of thousands of consumers who have called time and time again on the supermarket chain to join the Fair Food Program — is indisputable. Hundreds of consumers protest Publix in Atlanta, GA, one of countless Publix protests since 2009. A step in the right direction, but incomplete. What about #farmworkers who feed us? They deserve the benefits of democracy too, to feel safe & live w/dignity. 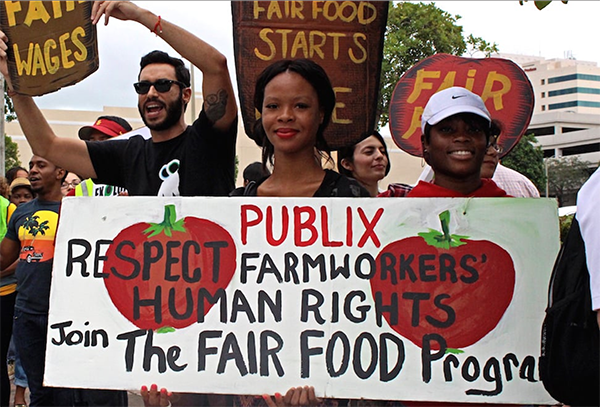 @Publix, sign the @ciw Fair Food Campaign! https://t.co/chSoYz38i5 Injustice anywhere is a threat to justice everywhere. 1. Publix refuses to join a program guaranteeing farmworkers better wages and protections from sexual harassment. 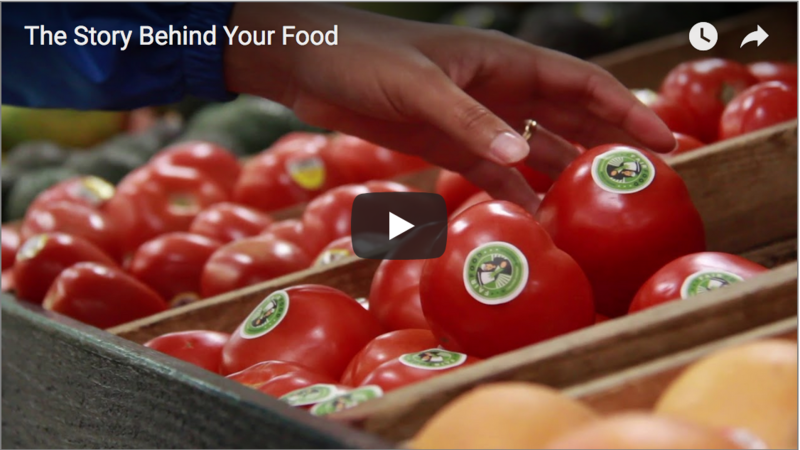 If you haven’t seen the 2014 documentary Food Chains, stop reading this article and go watch it. 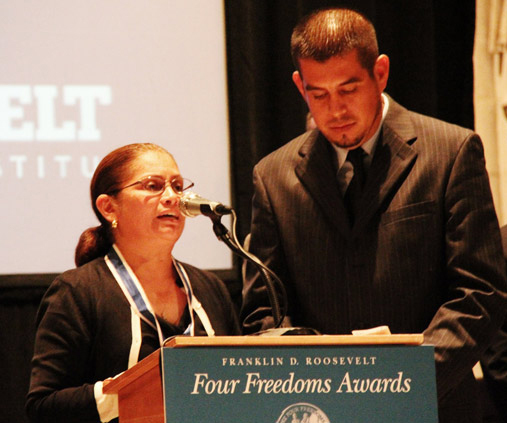 The film chronicles the Coalition of Immokalee Farmworkers, a labor-rights group in Southwest Florida that formed to protect the rights of people picking produce in the Sunshine State. Tomato and other produce pickers in Florida live in squalor because major grocery chains including Publix demand that produce be sold as cheaply as possible. Many live crammed into trailers with other workers, wake up before dawn, work impossibly long shifts in the sun, and rarely, if ever, see their families. 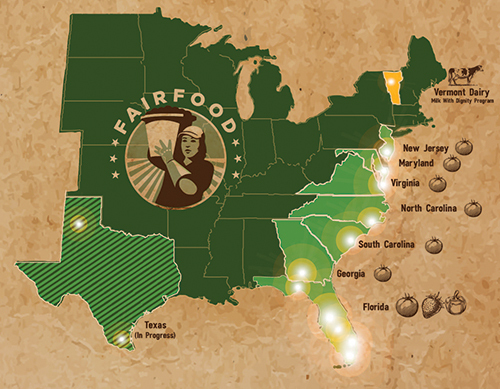 To help end this system, the Coalition of Immokalee Farmworkers created the Fair Food Program. Major, multinational corporations, including Walmart and Whole Foods, have joined and pledged to pay workers a penny more per pound of tomatoes picked. 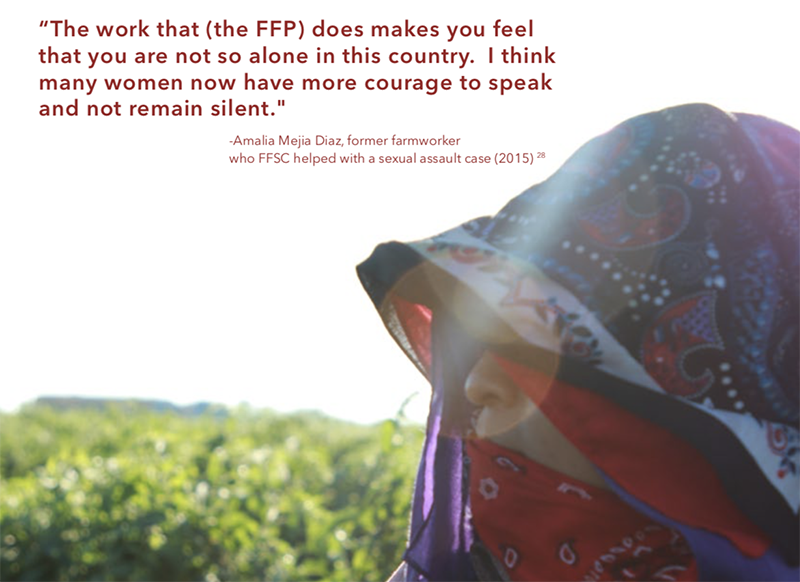 Because 80 percent of farmworker women report sexual harassment or abuse, companies that join the Fair Food Program also agree to stop buying products from farms where abuse is reported. Publix refuses to join the program. (Here’s its extremely callous statement about that subject.) The company refuses to even speak to the Coalition of Immokalee Farmworkers. 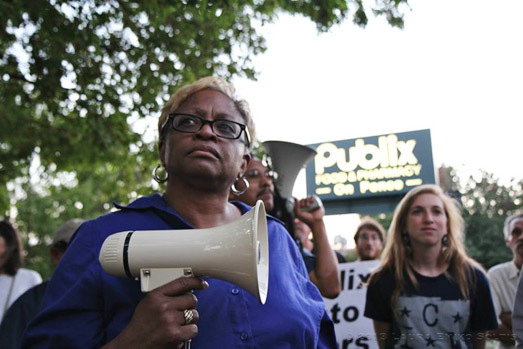 Food Chains documents a hunger strike the coalition held outside Publix’s headquarters, which wound up doing zilch to persuade the company to join the program. Even now that the #MeToo movement has taken hold, Publix has refused this simple step that can help protect farmworkers from sexual violence. Publix certainly did the right thing in suspending its political donations program. The growing resistance to the NRA and its unconscionable support for gun manufacturers and lax gun laws, while defenseless children are repeatedly slaughtered at school shooting after school shooting, can no longer be ignored. But human rights — whether it be the right to live free of gun violence, or the right to work free of sexual violence — are indivisible. Perhaps this latest episode marks a turning point for Florida’s “neighborhood grocer,” not simply an expedient decision designed to quell a potential public relations nightmare. We hope so, and therefore once again invite Publix to adopt a more inclusive vision of their “neighborhood” and join the Fair Food Program. 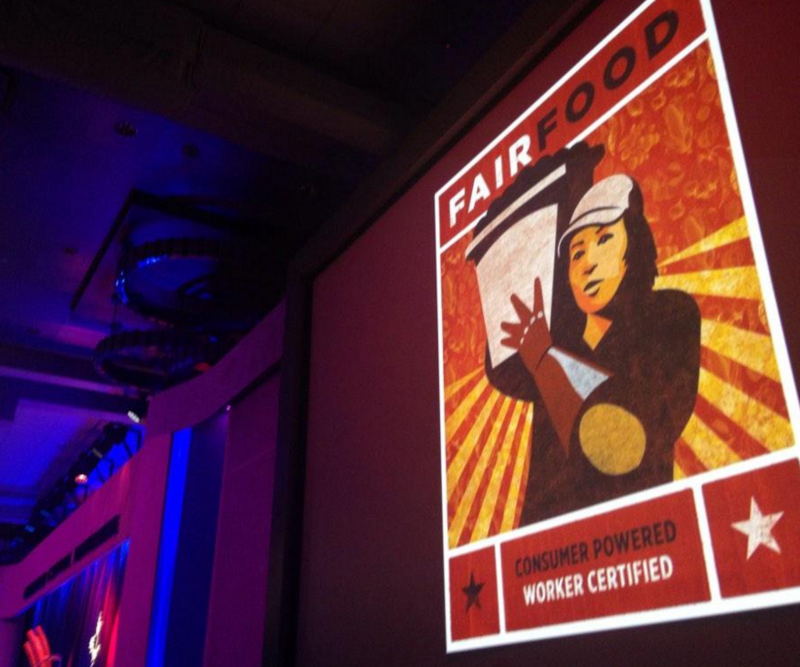 Fair Food Nation gears up for the June 5th Wendy’s Annual Shareholder meeting!